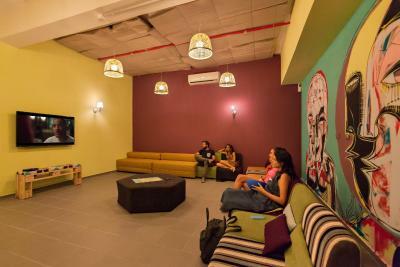 Lock in a great price for Abraham Hostel Tel Aviv – rated 8.9 by recent guests! The location is good, friendly staff, walkable distance to the beach, breakfast is good but you have to wash dishes yourself. 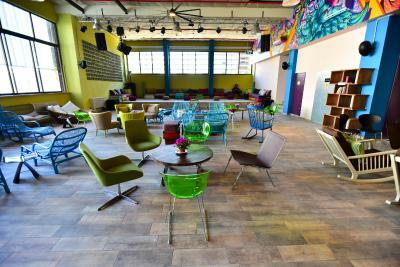 Nice ambiance, cool rooftop and very nice style of the hostel! Breakfast was great. Location was fine -- near a subway line which was still under construction though. Thirty min walk to the sea. Multiple activities were available right there in the Hostel. 1. Shuttle service to Tel Aviv airport at fixed rate of 70 shekel. 2. Although I didn't use the kitchen, I notice that guests can cook their own meal. This is very helpful for budget travel and getting something to eat Shabbat Day if you plan ahead to get groceries. 3. Paper map with hostel location is so helpful because my Google Map didn't work. Wish it is available online for better pre-visit planning and the ease to show to the locals for direction. Wish there is a map from hostel to major attractions including museums. 4. Tours departing from the hostel is fantastic, convenient with one less item (transportation) to plan/coordinate. 5. All front desk staff can speak English very well. 6. Bed sheet, pillow case, mattress cover, towel are clean. Mattress is thin but amazing comfortable. The blanket is not too heavy or too light and it keeps warm well. Hot showers work well. I liked the vibe of the hostel the most. met many interesting people there, will definitely come back. Staff are extremely helpful! The Tel Aviv Abraham Hostel was in a good location. The Hostel breakfast was wonderful. With our family of two adults and two teenagers we were extremely pleased that the property/facilities were clean, neat, organized, and safe. Excellent breakfast for the money. Great location for Tel Aviv. 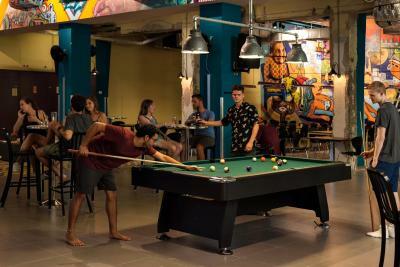 Abraham Hostel Tel Aviv is located in the Tel Aviv City-Center district, 1,950 feet from Independence Hall Museum and 2,300 feet from Shenkin Street. 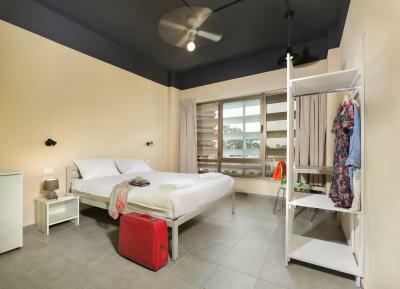 This air-conditioned hostel has a terrace and views of the city. Free WiFi is available throughout the property. All simply furnished rooms feature a refrigerator and a private bathroom with shower. There is a 24-hour front desk at the property. Bike hire is available at this hostel and the area is popular for cycling. 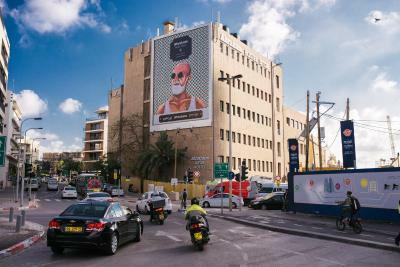 Nachalat Benyamin Crafts Fair is a 15-minute walk from Abraham Hostel Tel Aviv, while Meir Park is 0.8 mi away. Ben Gurion Airport is 9.9 mi from the property. This property is also rated for the best value in Tel Aviv! Guests are getting more for their money when compared to other properties in this city. 뀐 Located in the real heart of Tel Aviv, this property has an excellent location score of 9.0! 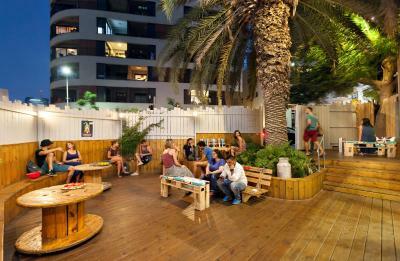 When would you like to stay at Abraham Hostel Tel Aviv? This twin/double room has air conditioning, views of the city, and an private bathroom. This family room features air conditioning and soundproofing. This colorful room features air conditioning,a satellite flat-screen TV, views of the city and an private bathroom. Free toiletries, coffee and tea facilities are also included. This suite has a seating area, tile/marble floor and microwave. This suite has a soundproofing, seating area and electric kettle. 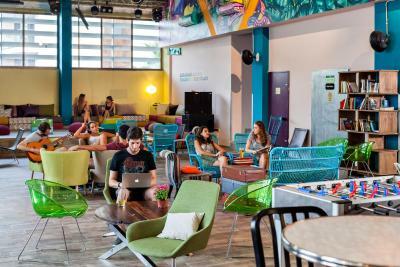 House Rules Abraham Hostel Tel Aviv takes special requests – add in the next step! Abraham Hostel Tel Aviv accepts these cards and reserves the right to temporarily hold an amount prior to arrival. Please note that this property is not Kosher. Please note that guests under the age of 18 must be accompanied by a parent and cannot be accommodated in dormitories. When booking for more than 10 guests, different policies and additional supplements may apply. The bed sheets and covers could be more comfortable. 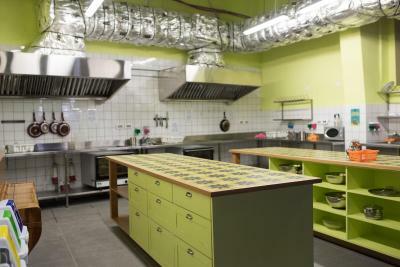 For a budget hostel, I think it is good choice. Travelers can use the public kitchen. There are many activities every week, which makes people stay there very interesting. Remember to wash the dishes by yourself after breakfast. 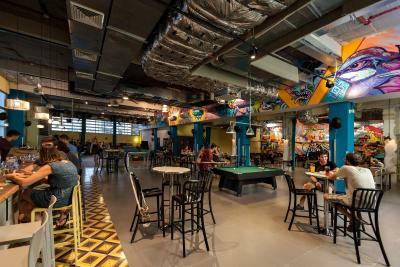 Great socialising spaces - both a huge breakfast/socialising room and a roof terrace. Great range of breakfast options. Very good location. Helpful staff, including travel booking facilities on site. Beds were very small and WiFi did not work. The traffic noise level. Very loud. The hostel is well managed with one-stop services. The staff is very friendly and helpful. Additional credit should be given to them for retrieving my glasses and sent it to Jerusalem office. It is a wise choice to stay at Haraham hostel as the first stop of my tour. I love the staffs there, they r nice and funny! The group activities are definitely worth to join ! You will love it! I would say that the prices offered aren't really the prices you would expect in a hostel. A bed in a quite big dorm costs around 25 euro, that is not really cheap. The trips as well have not really competitive prices. For what concerns me, I needed to reach the airport on Friday morning, and even if it was not Shabbat yet, they weren't able to give me any advise about how to get there with public means of transportation. In the end I was forced to take their shuttle service (that was nothing more than a taxi that they booked for us), and I paid for it 17 euro, again, not a really competitive price. The breakfast is included and quite various, even if vegeterian. 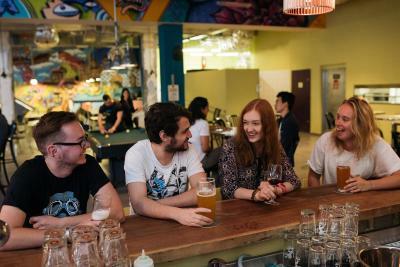 The atmosphere is really chill and relaxed, with a lot of young people with whom have a chat and a beer during evening time. Furthermore, the hostel offers a lot of possibilities in getting to know the place and the culture of Israel. A good place where to start your journey. The girl in the Tours assigned that day i try to ask for assistance about the tours wasn't so nice and seems so sarcastic. I expect for a friendly and helpful tour reception in charge like the one in Jerusalem. So frustrating.